Last night J and I watched Star Wars: Episode IV, A New Hope (Special Edition) and had much fun digging out his collection of action figures (in their Darth Vader carrying case, of course), taking pictures of them and tweeting those images with appropriate quotations from the film as we watched it. When we reached the Death Star battle sequence, J decided that we should take the accompanying picture. 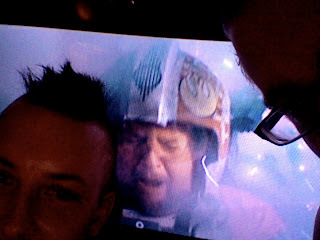 It captures the exact instant when fighter pilot Porkins, an early fatality in the fight, was doomed. For some reason, this rather minor event in the movie, has always been for both of us disproportionately memorable. And far funnier than it really should be. We think it may trip the same silly-giggle switch as all the other blatant prejudices that permeate Star Wars: the kinda-fat dude is named Porkins and is one of the first to get blown up; Jawas, a sentient race, are, in the estimation of a droid, "disgusting creatures"; a Wookie, also sentient, is "that thing" and "a walking carpet"; the Imperials evidently employ no "aliens" at all (but they have a monster in a trash compactor on a space station for some reason), and so on. 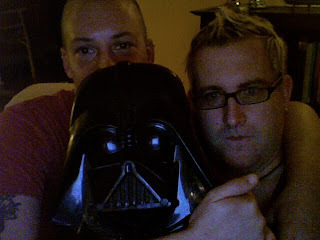 I am also including pics of us with the Darth Vader carrying case and of the extremely rare Snaggletooth action figure. I was most impressed that J had that one because I somehow lost mine way back in the day and was never able to track down a replacement. The rare version of Snaggletooth is actually the tall version with the blue suit. It was created for an early Cantina playset, but the pictures used to create the first figure only showed the head, so the sculptors didn't know the character was supposed to be a dinky little guy. The version you have in the picture is the one released by itself, and is about the same in rarity as the other average figures from the time. I had that one too, but I chewed its nose off. I was about four at the time. Ah, indeed, I remember now that business about the blue Snaggletooth! J seems to think that the one he has one of those that they sent to people in exchange for sending in a certain number of proof-of-purchase symbols from other figures, but I'm not sure about that. It's certainly possible, because I picked up second copies of C3PO and a storm trooper like that. Also, the first run of Boba Fett was offered like that sometime before the rest of the Empire Strikes Back figures were out in stores.I ended up with two Boba Fetts that were slightly different in their coloration somehow. 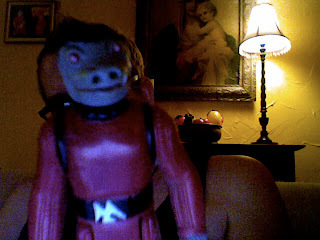 Now I wish that my own set of those figures were here (their in storage up at my Dad's) because J is missing a lot of them that I had and we could have more throughly reenacted the movie via Twitpic last night! Neither of us have down here our big 12 inch figures--those were the BEST! The large Boba Fett has all kinds of accessories and you can look through his "eye" (hole that goes through his head, like the old 6 Million Dollar Man doll), and it has knee and elbow joints so you can pose it in all kinds of ways. A quick flip through my copy of The Star Wars Action Figure Archive (which is copyrighted 1999 and is now woefully out of date, but the info on the old figures should still be accurate) would suggest that Snaggletooth was never a send away figure. The blue version was apparently available only at Sears, so maybe that's where Jeff got the idea. And yes, I own a copy of the Star Wars Action Figure Archive. You may now stone me for my nerdiness. Sears had a Christmas catalogue special every year, and the first was a cardboard cantina playset with an exclusive blue Snaggletooth. Later exclusives included a Hoth hanger bay with the land of Jawas playset base cast in white snow, and a cardboard AT-AT that used the same base. One of the Return of the Jedi exclusives used the droid factory base as a Jabba's Palace droid torture room and came with later general release versions of Jabba's white torture droid, a Klaatu and a Niktu.